Thousands of nurses risked their lives on the battlefields and in the hospitals to care for the wounded during World War 1 and at least 1500 were killed either from disease, by accident or as a result of enemy action. Their names weren’t included on War Memorials because they were women. That is now changing. 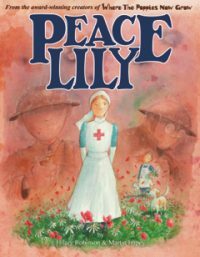 Peace Lily pays tribute to all those brave women who helped with the war effort and brings all four stories in the series together with an uplifting ending of a new, peaceful beginning.